Part of our Vanguard Series, the F-4 is the more cost effective sister to the Phantom. Heavy, percussive distortion tones mark the modern but more moderately priced F-4. 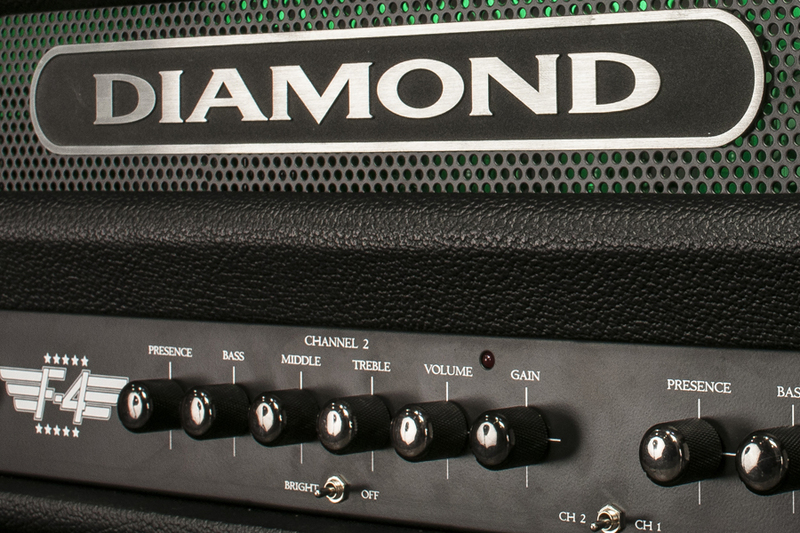 A Diamond product through and through, the 2-channel F-4's front panel boasts a dialable "deep" control, and the front panel has a “bright” switch as well. Front panel controls also include a master volume, and a full range of tone controls (Bass, Middle, Treble, Presence) for both channels. Like all current and future Diamond Amplification products, the F-4 features the highest quality components and construction. The F-4 uses 5 12AX7 preamp tubes and 4x 5881's for its power stage. Each part was personally spec'd and tested by us to ensure maximum performance and reliability, from the transformers to the switches and knobs. The head features perforated metal grille in the Tolex wrapped front panel, and an accompanying black grille on the back finished in black powder coating. Even the knobs are metal for look and feel. Green LED's light the inside of the head as well. Priced for the working musician, and everything he needs in one package, the F-4 delivers.